The Council of Europe has released a scathing report into the death of 63 migrants on a boat which tried to cross the Mediterranean last year. 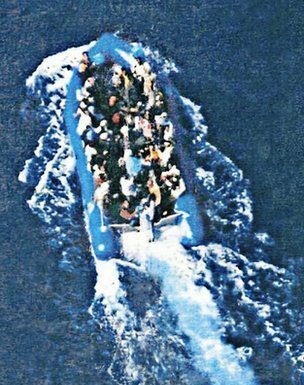 A small blue rubber boat carrying 72 people set sail from Tripoli shortly after midnight on 26 March 2011. Fifteen days later, the boat washed up again on the Libyan shore. Just nine young men were still alive, despite the fact the boat had previously been spotted by a military helicopter, a military vessel, an airplane, and two fishing boats in a zone under Nato control. Pressure is mounting on Nato to respond to a series of unanswered questions concerning the tragedy, with European politicians repeating their demands for a further inquiry and human rights lawyers announcing the launch of legal action against those responsible for the “avoidable” loss of life. The Spanish government is due to unveil what is expected to be one of the toughest budgets in its recent history. Newly-elected Prime Minister Mariano Rajoy has already warned the budget will be “very austere”. On Thursday, Spanish police clashed with protesters after a general strike was held to protest against labour reforms designed to cut unemployment. It was a largely peaceful general strike in a country whose sinking economy, with 23% unemployment, has become the focus of worry about the future of the whole eurozone area. More than two years into a debt crisis that has raised fundamental questions about the longevity of the euro, the single currency’s finance ministers are to decide today how much money they are prepared to put up to secure it. Meeting in Copenhagen, the eurozone ministers look likely to clash over the scale of a permanent bailout fund coming into operation in July, although German insistence that it should not exceed €700bn (£580bn) looks likely to hold sway. A draft statement leaked on Thursday said the bailout fund would be capped at €700bn and fall back to €500bn when current lending programmes expire, but that a further €240bn would be held in reserve to ensure the fund’s lending capacity. Italians have been left shocked by two cases of men setting themselves on fire in the past two days in protest at their financial hardship. A 58-year-old builder accused of tax evasion set himself alight in his car in Bologna on Wednesday. Another builder, a 27-year-old Moroccan, set himself on fire outside the town hall in Verona on Thursday, saying that he had not been paid for four months. Both men are being treated in hospital. French elite police have arrested around 20 people in suspected Islamist militant circles in early morning raids on Friday, a police source has said. The arrests in Toulouse in the south-west, Nantes and Le Mans in western France, and in the Paris region, were carried out by the Raid police commando unit. Money from the London-based European Bank for Reconstruction and Development (EBRD) has been distributed to individuals connected to Belarus’ President Alexander Lukashenko, according to a career politician in the regime. “The credit line is supposed to go to small business owners but anyone who is not connected to Lukashenko will never get it,” Viktar Ivashkevich, who co-chairs the council of people’s assembly in Minsk, has said. Last year, the EBRD financed 7,626 projects in Belarus for a total of just over €65 million. So few people are applying for jobs in the European Commission that the official in charge believes it will soon no longer be possible to guarantee a high calibre workforce where all member states are fairly represented. EU commissioner Maros Sefcovic, in charge of administration, says salaries for the commission are too low to be attractive to candidates from rich member states. Ruling parties, political elites and former ministers in a string of EU countries are embroiled in cash-for-influence scandals that are exposing widespread allegations of corruption, triggering public revulsion and a voters’ backlash. Austria, Slovakia, Croatia and the Czech Republic are in the throes of sleaze allegations involving senior politicians and governing parties said to be funded by dirty money. The scale of the alleged corruption, revealed by parliamentary inquiries, court cases, secret police files and whistleblowers, is such as to make David Cameron’s alleged suppers-for-sale predicament look trivial. A six-legged calf has defied the odds by thriving despite a vet’s prediction at birth that it would not survive. Seven-week-old Lilli is a minor celebrity in her native Switzerland after local media were splashed with images of the calf frolicking in a sunny field. Farmer Andreas Knutti from Weissenburg, 19 miles south of the capital, Bern, says he couldn’t bring himself to euthanise the animal because she was “so full of life”. Baby, a 40-year-old Asian elephant, shocked people in Cork when she escaped from a circus at bath time and went for a walk around the city centre. The elephant was videoed outside a coffee shop and running through a busy car park before being brought under control by her handlers. Athens police say a goat herder attempted to sell a €12m marble sculpture of a young woman for just €500,000. The sculpture, found hidden in a goat pen, dates from about 520BC and belongs to the kore type, a police statement said.